An ArUco Board is a set of markers that acts like a single marker in the sense that it provides a single pose for the camera. However, boards are not limited to this arrangement and can represent any 2d or 3d layout. The difference between a Board and a set of independent markers is that the relative position between the markers in the Board is known a priori. This allows that the corners of all the markers can be used for estimating the pose of the camera respect to the whole Board. When you use a set of independent markers, you can estimate the pose for each marker individually, since you dont know the relative position of the markers in the environment. The pose estimation is much more versatile. Only some markers are necessary to perform pose estimation. Thus, the pose can be calculated even in the presence of occlusions or partial views. The obtained pose is usually more accurate since a higher amount of point correspondences (marker corners) are employed. The objPoints structure is the list of corner positions in the 3d Board reference system, i.e. its layout. For each marker, its four corners are stored in the standard order, i.e. in clockwise order and starting with the top left corner. The dictionary parameter indicates to which marker dictionary the Board markers belong to. Finally, the ids structure indicates the identifiers of each of the markers in objPoints respect to the specified dictionary. A Board detection is similar to the standard marker detection. The only difference is in the pose estimation step. In fact, to use marker boards, a standard marker detection should be done before estimating the Board pose. markerCorners and markerIds: structures of detected markers from detectMarkers() function. cameraMatrix and distCoeffs: camera calibration parameters necessary for pose estimation. rvec and tvec: estimated pose of the Board. If not empty then treated as initial guess. The function returns the total number of markers employed for estimating the board pose. Note that not all the markers provided in markerCorners and markerIds should be used, since only the markers whose ids are listed in the Board::ids structure are considered. As it can be observed, although some markers have not been detected, the Board pose can still be estimated from the rest of markers. Creating the Board object requires specifying the corner positions for each marker in the environment. However, in many cases, the board will be just a set of markers in the same plane and in a grid layout, so it can be easily printed and used. 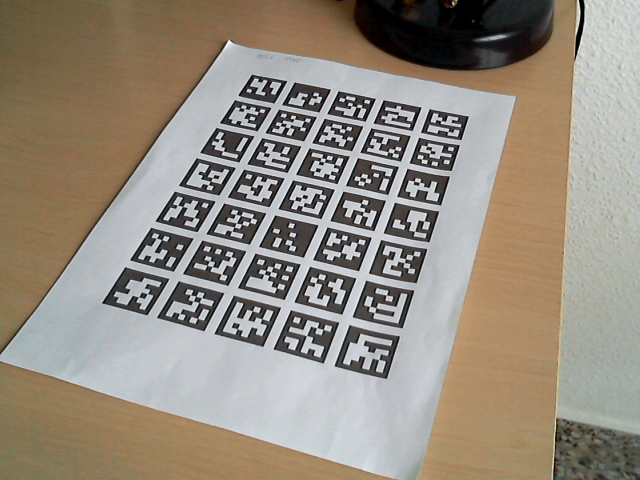 Fortunately, the aruco module provides the basic functionality to create and print these types of markers easily. Number of markers in the X direction. Number of markers in the Y direction. Lenght of the marker side. Length of the marker separation. The dictionary of the markers. Ids of all the markers (X*Y markers). The first and second parameters are the number of markers in the X and Y direction respectively. The third and fourth parameters are the marker length and the marker separation respectively. They can be provided in any unit, having in mind that the estimated pose for this board will be measured in the same units (in general, meters are used). Finally, the dictionary of the markers is provided. So, this board will be composed by 5x7=35 markers. The ids of each of the markers are assigned, by default, in ascending order starting on 0, so they will be 0, 1, 2, ..., 34. This can be easily customized by accessing to the ids vector through board.ids, like in the Board parent class. 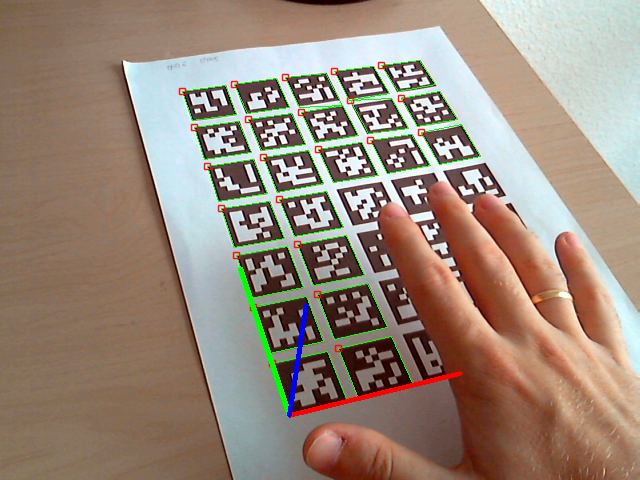 The first parameter is the size of the output image in pixels. In this case 600x500 pixels. If this is not proportional to the board dimensions, it will be centered on the image. boardImage: the output image with the board. The third parameter is the (optional) margin in pixels, so none of the markers are touching the image border. In this case the margin is 10. Finally, the size of the marker border, similarly to drawMarker() function. The default value is 1. A full working example of board creation is included in the create_board.cpp inside the module samples folder. A full working example is included in the detect_board.cpp inside the module samples folder. ArUco boards can also be used to improve the detection of markers. If we have detected a subset of the markers that belongs to the board, we can use these markers and the board layout information to try to find the markers that have not been previously detected. This can be done using the refineDetectedMarkers() function, which should be called after calling detectMarkers(). The main parameters of this function are the original image where markers were detected, the Board object, the detected marker corners, the detected marker ids and the rejected marker corners. The rejected corners can be obtained from the detectMarkers() function and are also known as marker candidates. This candidates are square shapes that have been found in the original image but have failed to pass the identification step (i.e. their inner codification presents too many errors) and thus they have not been recognized as markers. Distance between the candidate and the projection of the missing marker. To obtain these projections, it is necessary to have detected at least one marker of the board. The projections are obtained using the camera parameters (camera matrix and distortion coefficients) if they are provided. If not, the projections are obtained from local homography and only planar board are allowed (i.e. the Z coordinate of all the marker corners should be the same). The minRepDistance parameter in refineDetectedMarkers() determines the minimum euclidean distance between the candidate corners and the projected marker corners (default value 10). Binary codification. If a candidate surpasses the minimum distance condition, its internal bits are analyzed again to determine if it is actually the projected marker or not. However, in this case, the condition is not so strong and the number of allowed erroneous bits can be higher. This is indicated in the errorCorrectionRate parameter (default value 3.0). If a negative value is provided, the internal bits are not analyzed at all and only the corner distances are evaluated. It must also be noted that, in some cases, if the number of detected markers in the first place is too low (for instance only 1 or 2 markers), the projections of the missing markers can be of bad quality, producing erroneous correspondences. See module samples for a more detailed implementation.